Kayse Pratt is my kind of girl. I’m a organizer. But until I sat down to put Kayse’s words about a Home Management Notebook to practice, my pile of lists and calendars and projects was a tad out of control. I’d been keeping close a calendar with to-do lists, a notebook with other to-do lists related to various projects, file folders for our vacation lake house and the other vacation rental I help manage, my journal, and the hard copy of the book I’m writing. Y’all, that’s a lot of papers. And I don’t really like clutter. 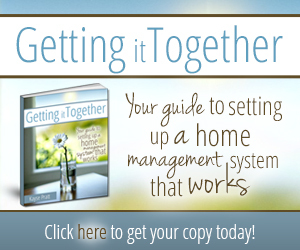 “Getting it Together: Your Guide to Setting up a Home Management System that Works” helped me consolidate. Kayse’s recommendations that led me to organize my organization system came at a really great time. My favorites are the weekly and monthly meal plans, freezer inventory, daily schedule, master project list, cleaning schedule, and the blogging calendar. Kayse has them designed in cute blue and green colors, but I printed plain-o black-and-white copies out of convenience. Your Home Management System can be as pretty and creative as you like. That’s the beauty of this system — it can be as simple or elaborate as your choose. Kayse’s book includes printables pertaining to auto maintenance and finances, but those aren’t areas I wanted to include this binder. I did print master project lists for our house as well as each of the vacation rentals. My categories are Calendar, Around the House, Meals, Blogging, Kentucky Lake Lodge and The Gathering Place. 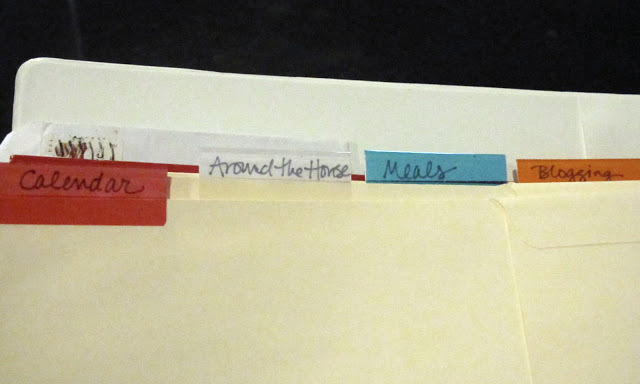 Oh, and I used dividers with pockets, you know, for a little bonus organization. Again, it’s wide open. Your categories can be whatever you want them to be. My system is putting all those different notebooks and folders I’ve been carrying around and keeping close in one place. It’s not quite world peace, but, seriously, organizing these papers and lists is high up on my list of my favorite things. Trust me, this short book is worth your time. And if Kayse didn’t live on the other side of the country, I’d be inviting her over so we could scrapbook, write with Sharpies, and perhaps organize another pile I have sitting around here. You’ll want to be her friend too, but perhaps you can start with her book. 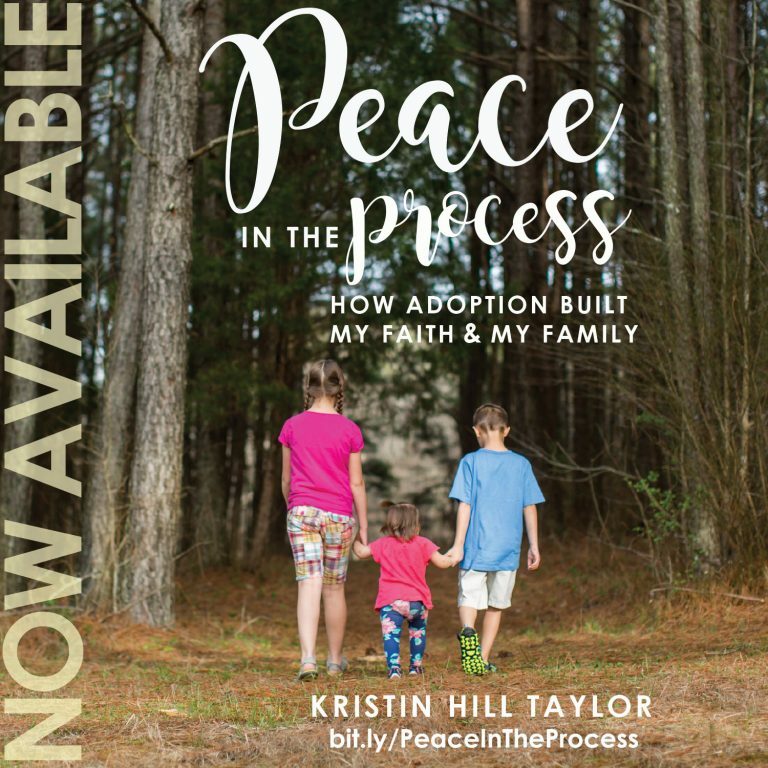 You can buy the PDF version of “Getting it Together” from KaysePratt.com or the Kindle version from Amazon.com. Both are $3.99. 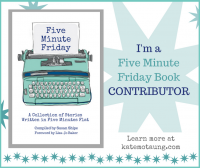 But one of you will get a free PDF copy, courtesy Kayse! Whoo-hoo! To enter, leave a comment below: Do you have an organization system in place for your household? If so, what do you like about it and what would you change? And you’ll see there are some other ways to earn extra entries. The giveaway ends Friday. 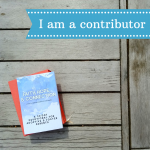 I received this e-book for free by subscribing free to Kayse’s monthly newsletter earlier this year and was offered it again to review, but these opinions are mine and so is the binder I compiled. This post contains affiliates links.